The piercing screech of metal-on-metal alerts New York City subway riders that a train is arriving; nine thousand miles away in Seoul, subway riders are alerted by a joyful jingle. This startling difference is one of many between the two systems. One is starkly more modern while the other could use serious improvements. New York’s subway systems currently have 21 numbered and lettered routes compared to Seoul’s 9 numbered lines. However, Seoul Metro serves a greater annual ridership of 2.620 billion compared to the MTA’s 1.763 billion. Glowing digital advertisements, bright lights and polished marble floors greet passengers when they step into a Seoul Metro station. For a moment they may even forget they are in an underground tunnel. New York subway riders are often greeted by dimly lit lights, the stench of urine and floors suffused in litter. Seoul’s subway stations are lined with a rich assortment of shops such as clothing stores, coffee houses and skincare salons, but New York only has this lineup of stores in a few of their major stations. In contrast, the grimy, congested fast food options and coffee shops in New York’s major stations do not have as near a variety as Seoul’s stations. Bathrooms in Seoul Metro stations are kept clean and are widely used, unlike their New York counterparts. Many avoid the subway bathrooms that are filthy and has unflushed toilets with pools of urine on the floor. Trains also include the added amenities of hanging handrails and cushioned seats– features that New York subway trains do not possess. Seoul straphangers enjoy a better way to pay for their rides. The systems sells a durable, endlessly rechargeable hard plastic card called T-Money. This card can also be used for bus and taxi travel, as well as convenience store purchases. Additionally, the T-Money card can be used on mobile phones, and online to purchase merchandise. Riders can also get a 500 won (50 cents) deposit refund once they’re finished using the cards. Seoul has successfully added free ubiquitous wi-fi in their public transportation while New York is just beginning to roll out a similar service. So far just 151 of its 468 stations offer access. Koreans travel outside the platform screen doors that improve security and prevent accidental falls onto the subway tracks in Seoul, South Korea. Photo by Taylor Ha. Falling or jumping passengers is not an uncommon occurrence in New York subway stations; around 50 people die from subway related deaths in New York every year. This is not a common problem of Seoul’s subway system because of sliding glass screen doors that act as barriers between the tracks and the platform. These platform screen doors (PSDs) were first installed in 2005, after a subway fire in 2003 ignited safety concerns. The city then had PSDs constructed in every station by 2009. 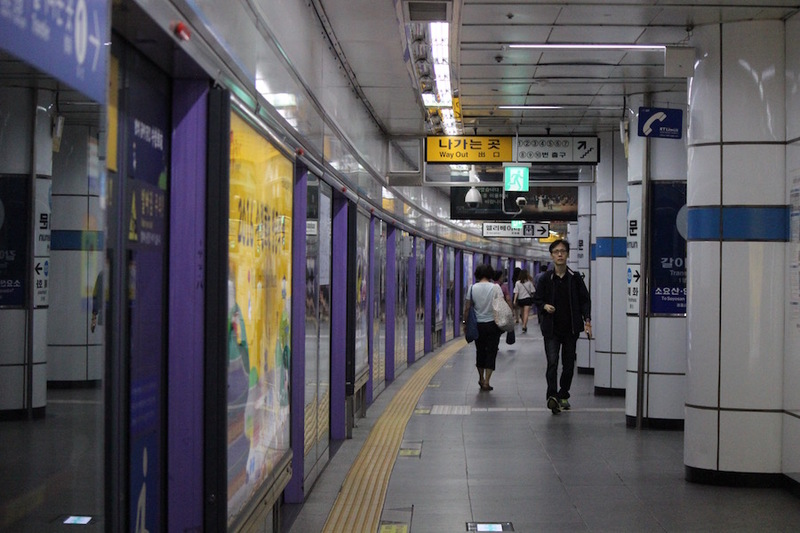 Though Seoul’s subway system is much smaller in size, it gives its bigger population a more comfortable and efficient experience – aspects that subways in New York often lack. This entry was posted in featured story 2, Stories. Bookmark the permalink.